Today was a moving day which I don’t really like, but it’s fun to set up a new camp. Also my new tent mates are awesome! This morning we ate our first meal together and then roped up as a tent group. 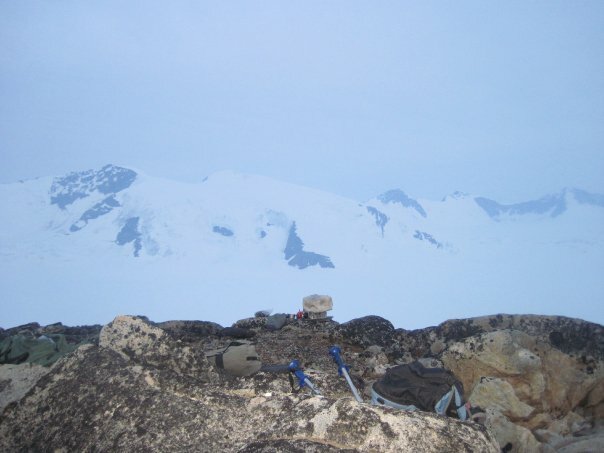 Then we hiked down the glacier about three miles, until we got to Meteor peak, the mountain we all want to climb. While looking for a campsite, one of the guys looked up at this rocky jut-out covered in snow, and asked “what about up there?” At first I wasn’t too excited about camping up there considering it didn’t seem too shielded from storms, and it would be so hard to climb up with a full pack. We all agreed to send up a scouting team, who camp back down and told us the spot seemed perfect. So up we went. The climb wasn’t as hard as I’d anticipated, but on the upper rocky slope it got too steep for me to carry my heavy pack, so Will came and grabbed my pack from above for me. Once I finally got to the top, I realized we were at the most awesome campsite yet! 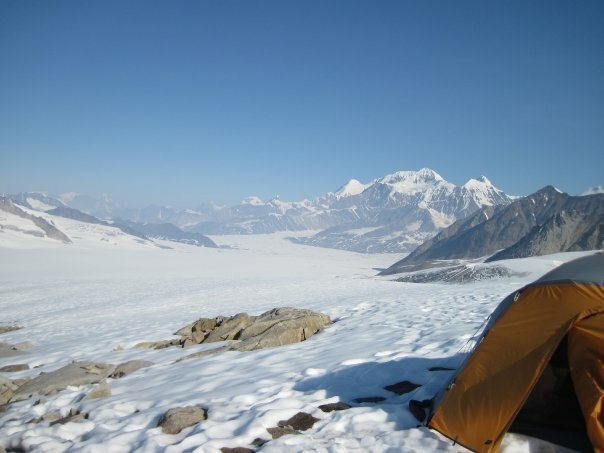 We could put our tents on the comfortable snow, get plenty of water, and use the rocks for kitchens and bathrooms. The other awesome part was no perimeter camping, which meant no hours of probing! Woohoo! Next my tent group had ramen noodles for a snack, and then we went to class. Class today was awesome, since the point was to relax for two hours and take in the view. I loved it because we were all on this giant rock island, and we could all spread far enough apart to not even have to see each other. I love it. So peaceful!! For dinner my group cooked pasta with a white sauce and tuna, and for dessert? Ice cream. It turns out Jake is a culinary genius, haha. 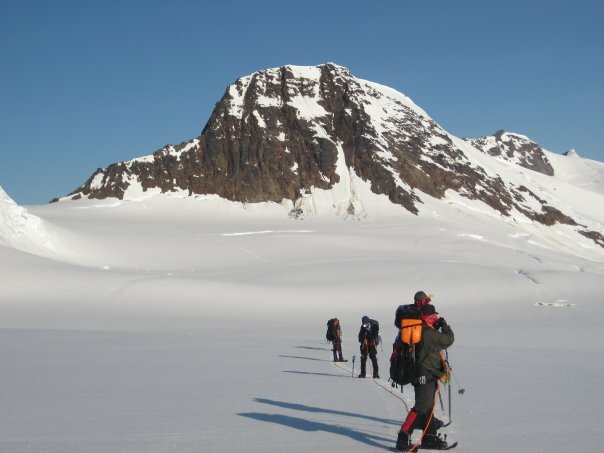 Also tomorrow I’m leading another climb up a peak just across the glacier with me, Kai, Geoff, Evan, Jake and JP. I’m excited since I really like that group, and there’s a good possibility we’ll climb a second peak from there! Speaking of that, I have to be up for a weather check at 3:30am so we can leave by 4am, so I’d better get to sleep. I love that we’re doing some real mountaineering!